Easily connect Raspberry Pi to Gmail, Facebook, Twitter & more! Easily connect your Raspberry Pi to web services and social networks! This tutorial demonstrates how to painlessly send and receive Gmail on the Raspberry Pi from Python, which in turn, allows you to easily connect it to web services and social networks like Facebook, Twitter, and more! This would normally be well beyond the abilities of most users due to the inherent complexities of programming through social media APis, client/server authentication, etc. However, with the easy-to-use web service Swiss Army knife ifttt (if this then that) anyone with even the most basic programming skills can dramatically expand the capabilities of their Raspberry Pi. If you are not yet aware, ifttt is a great tool to simplify interaction with many social networks and other web services. It operates with the premise that when some specific action occurs it should perform some other predefined action. The interface is intuitive and very easy to quicky understand. The bridge then is connecting the Raspberry Pi to any of these supported services, which in turn, enables the use of all other services that can respond to that respective trigger. 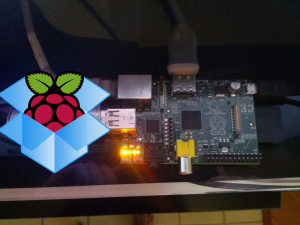 In an earlier tutorial, I previously demonstrated how to connect your Raspberry Pi to your Dropbox account using SSHFS. This is another perfectly viable option to establish two way communication with ifttt. However, instead of using email as the primary communication medium, it relies on Dropbox and the filesystem itself. Depending on your application, this may or may not be a better option. The tutorial uses the most recent Raspbian wheezy image, (2012-08-16-wheezy-raspbian)but should largely generalize for not only other Raspberry Pi distributions, but most other linux distributions as well (especially those derived from Debian, such as Ubuntu and Mint). The majority of the complexity and functionality comes from the feedparser Python module, which should be available essentially anywhere with Python support, even including Windows and OSX distributions too. In any case, begin by setting up the necessary accounts. As you would undoubtedly expect, the ability to send and receive Gmail is predicated upon having a Gmail account. You are welcome to use your personal Gmail account if you wish, however, I recommend creating a separate account for the Raspberry Pi as it provides the most flexibility. 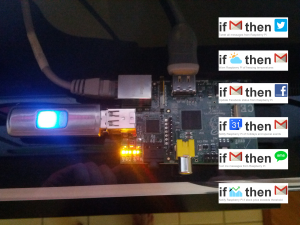 If you would like to expand beyond the capabilities of Gmail on the Raspberry Pi, you will also need an account on ifttt. As with Gmail, you can either share your accounts with the Raspberry Pi, or create a separate account specifically for this purpose. Your decision here might be dependent on which services will be necessary for your own specific application. Now that all of the prerequisites are installed, we can move on to the actual code! This is an example script that will check the Gmail of the specified user, and display the subject line of all unread e-mails. This is an example script that can be used to send plain text e-mails with Gmail to the specified mail to e-mail address. This is a more complex example script that can be used to attach files to emails sent from Gmail. It sends an array of attached files to an array of recipients. Now that the Raspberry Pi is capable of both sending and receiving e-mails and running scripts at regular intervals we can move on to fun things! The following are some quick examples of the types of things this interface enables. This list is FAR from inclusive, there are literally thousands of possible combinations! Update your Facebook status, or post tweets based on raspberry pi events. Alternatively, create a Facebook or Twitter account specifically for the Raspberry Pi, and have it update its own status messages and post its own tweets. Automatically send alerts for events that match certain criteria within your Google calendar to the Raspberry Pi. Use this to make things like physical notifiers for holidays or other calendar events. 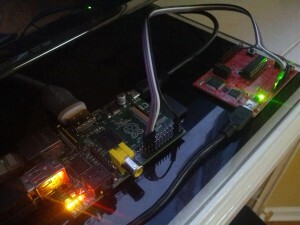 Receive SMS notifications or phone calls based on events from the Raspberry Pi. Notify based on certain sensor values, or create your own DIY security system, for example. It’s also easy to control the Raspberry Pi based on the weather forecast. For example, send notifications of impending severe weather or extreme temperatures. Or create physical notifiers that perform actions whenever a specified stock price exceeds or falls below a specified threshold. There are, of course, a few limitations from using Gmail and cron as the primary basis for communication to the cloud. Cron jobs can only be scheduled at minute granularity, that is, they can be scheduled to occur at maximum frequency of one minute intervals. This is acceptable for most tasks, though it does however leave a bit to be desired for the more ‘real time’ applications like turning on and off lights, or remotely operated robotics. 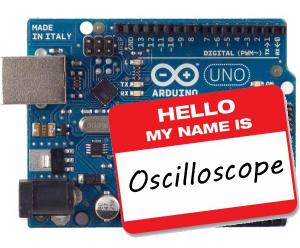 This tutorial will show you how to use your Arduino as an oscilloscope. 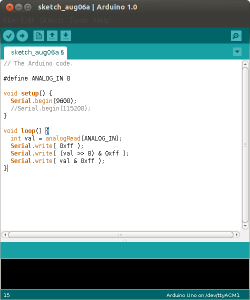 We end the tutorial with a verification portion that uses the Arduino to generate a square wave, requiring a single wire. 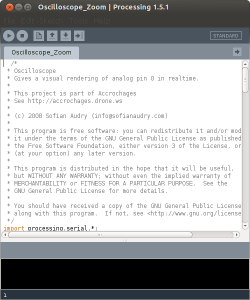 Lxardoscope is another Arduino + real-time graphing project that has the potential to turn an Arduino into an oscilloscope. Unfortunately, I was unable to get any readings (the visual graph remained static). Arduino uses a modified RXTXcomm.jar library. This causes a problem when the processing project runs poor man’s oscilloscope and loads the RXTXcomm.jar library bundles with the processing project. Instead, we wish for process to load the modified Arduino RXTXcomm.jar library. To remedy this problem we simply replace processing RXTXcomm.jar with the Android specific RXTXcomm.jar. Running the processing command should result in a GUI application launching that looks a lot like the Arduino idea. Download and open the below code in processing and click play. * Gives a visual rendering of analog pin 0 in realtime. Arduinoscope has a simple arduino component to poll and forward analog 0 to the desktop via the serial connection. Save the below code and flash it to your Arduino. To test the oscilloscope we will generate data using the Arduino and feed it in to the analog A0 port to be viewed on our Desktop. Flash the code below to your Arduino. Connect pin digital pin 13 on the Arduino to analog pin A0. The above code will turn on and off the digital pin to produce a square wave. You can alter the baud rate from 9600 to 115200 in the arduino code as well as the processing code. 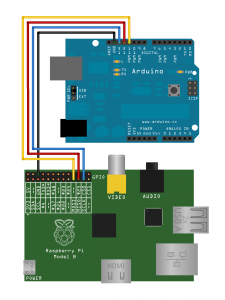 Raspberry Pi pin 18 can generate PWM and the arduino can be used to test it. 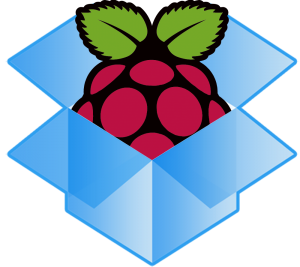 This tutorial will demonstrate how to mount Dropbox (or any filesystem) over the network on the Raspberry Pi using SSHFS (Secure SHell FileSystem). For this procedure to work for your Dropbox share, you will need another machine somewhere that is running Dropbox, and is accessible to the Raspberry Pi via SSH. Note: The following is not actually specific to the Raspberry Pi, nor to Dropbox. The tutorial generalizes for other systems and architectures that are not officially supported by Dropbox, as well as for mounting of other non Dropbox shares over the network. SSH is a secure protocol for communicating between machines. SSHFS is a tool that uses SSH to enable mounting of a remote filesystem on a local machine; the network is (mostly) transparent to the user. On the local computer where the SSHFS is mounted, the implementation makes use of the FUSE (Filesystem in Userspace) kernel module. The practical effect of this is that the end user can seamlessly interact with remote files being securely served over SSH just as if they were local files on his/her computer. 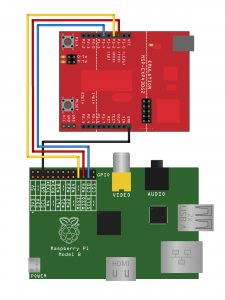 The first step is to configure the remote host that the Raspberry Pi will connect to via SSH. It will need to be running Dropbox, if you need to install it, follow the instructions for your respective OS here. If you are not yet a Dropbox user, and this has finally persuaded you to join, signup for Dropbox here. You will be prompted for the password on the remote one last time. Once entered, terminal output will confim the key was added sucessfully. Then press CTRL and X to exit the editor, then Y to confirm the changes (if using nano, the default text editior). That’s it! Reboot the Pi, and your Dropbox share will mount automatically on startup. Another method to accomplish this task would be to add a line to /etc/fstab to automatically mount the Dropbox SSHFS share. The following tutorial will describe how perform pulse width modulation using a MSP430g2553 TI Launchpad to control a sparkfun servo motor. Please see Cross-Compiling for TI MSP430 Launchpad to setup your development environment. 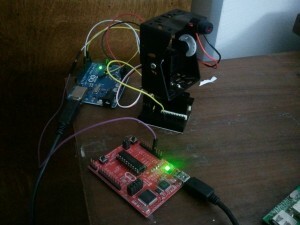 I’m using the Arduino to power the servo motors. Alternatively you may use USB, a wall plug, or a battery. The MSP430 is being used to generate the PWM for control. Connect your servo control wire to MSP430 pin P1.2. #include "msp430g2553.h" // make sure you change the header to suit your particular device. // Connect the servo SIGNAL wire to P1.2 through a 1K resistor. #define PWM_FREQUENCY       46      // In Hertz, ideally 50Hz. // Calculate the step value and define the current step, defaults to minimum. // Setup the PWM, etc. Compile install and run the code! If your lucky then your device will have moved a bit and you might notice that the device didn’t reach its full range of motion. You will need to play with the SERVO_MIN and SERVO_MAX constants to achieve the devices full range of motion. This section contains hints and debug strategies if things didn’t just magically work for you. The biggest trouble I had was getting the correct header file. An incorrect header file did not produce any warnings. The only feedback for a header file that didn’t match my board was the device moving less than 1 degree and behaving non-deterministic. Look at the documentation that came with your board to find the exact device. A list of device headers can be found in the directory /usr/msp430/include/. The mspdebug program hosts a suite of commands. 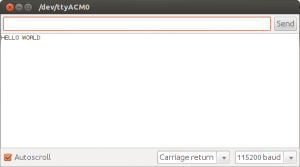 A list of commands can be gotten by typing help. The erase command is one that I found late into the night. Be sure to issue the erase command before you issue the load command. Often times when things aren’t working you will wonder if you broke the board because you touched some pin, got pissed off and threw it across the room, or your kitty cat Mr. Bigglesworth played kitty frisbee with it. Regardless of the reason you want some feedback that the board is still alive. 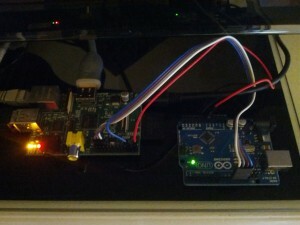 I like to reload a piece of code that blinks the development board built-in lights LED blinking tutorial.